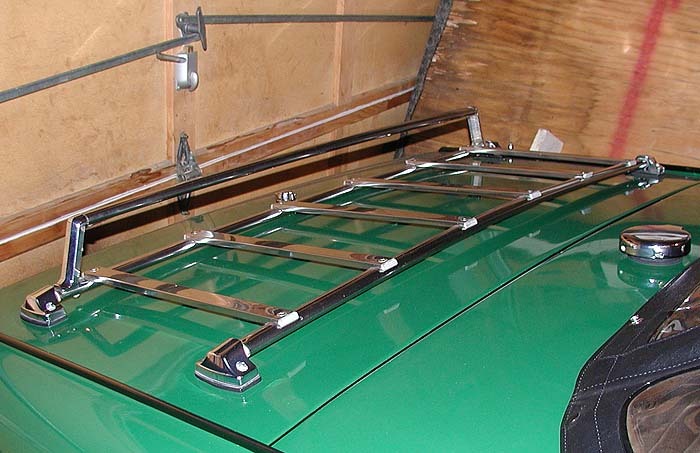 My 2 Spitfires came with two different luggage racks differing in width and number of slats. A 4 slat version came on my daily driver. 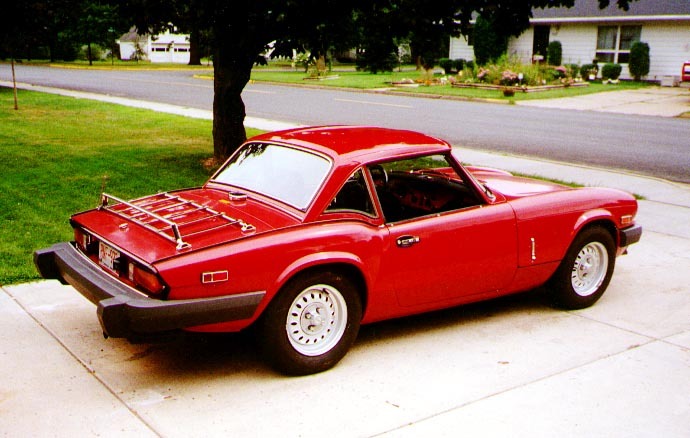 When this car was originally purchased by me it had very few original items from the factory on it. 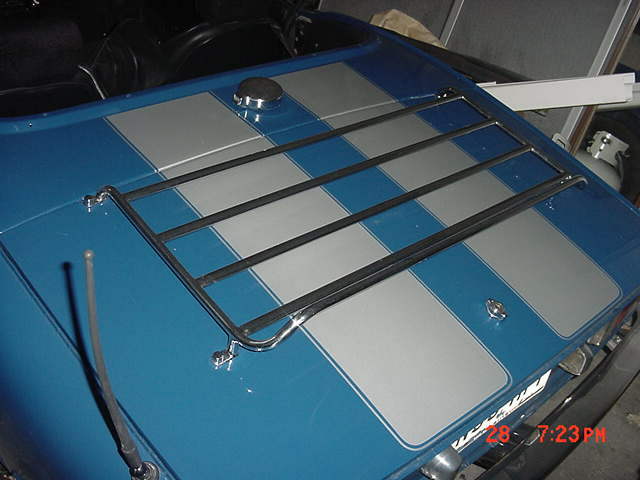 The six slat version came off my parts car, a very original car (it still had original Lucus brand headlamps). All this in mind, I have to assume that the 6 slat was factory and the 4 slat was not. 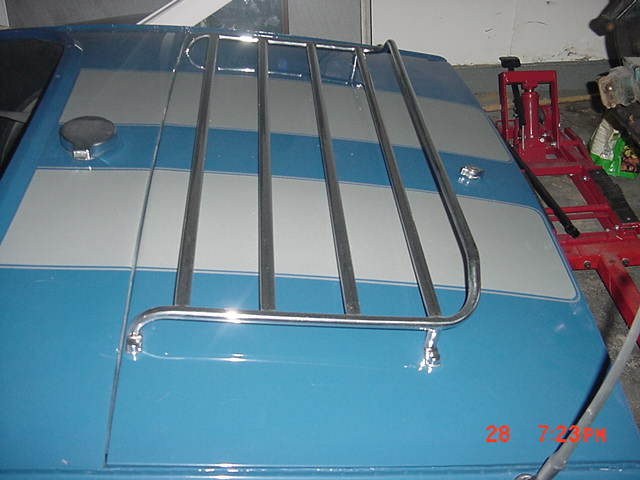 Shown are photos of my rack and other Spitfires of differing years with the 6 slat rack. 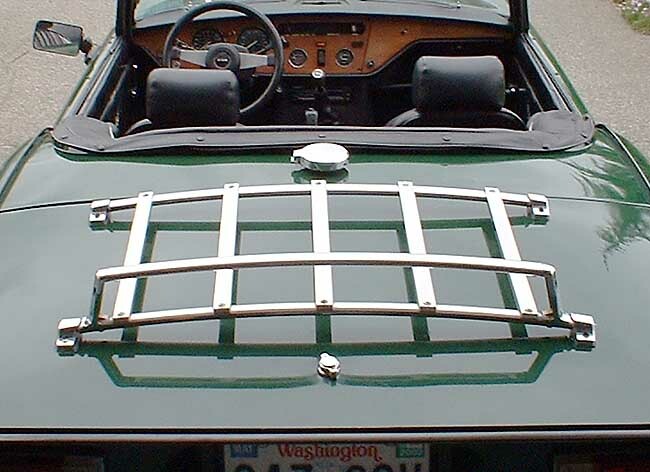 I have been told TR6's used this rack also in the mid 70's. 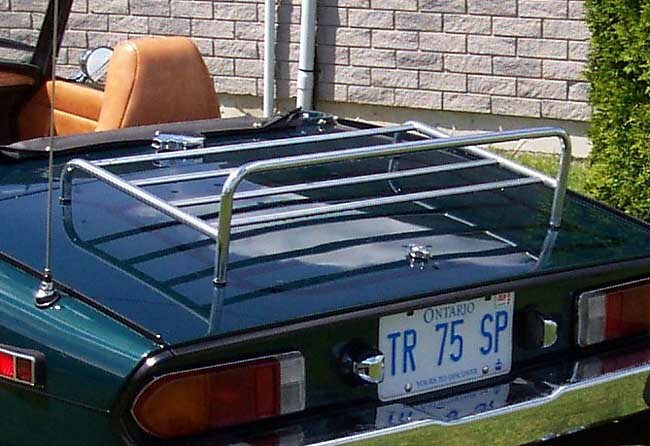 Same rack on Angelo Guarasci's 75 Spitfire. Has slightly different mounting hardware. 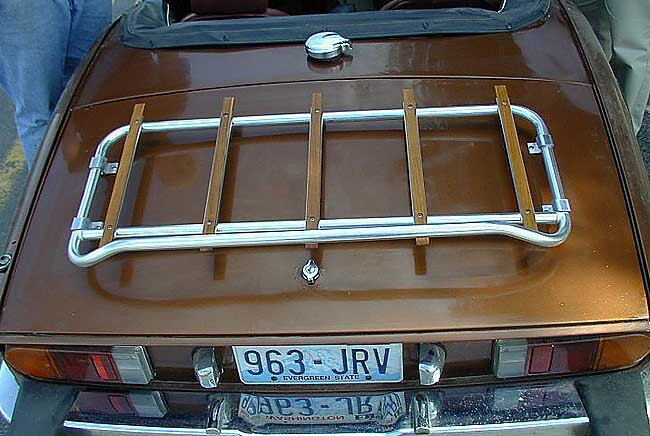 A similar chrome tubular rack on Kevin Wildner's 76 Spitfire. 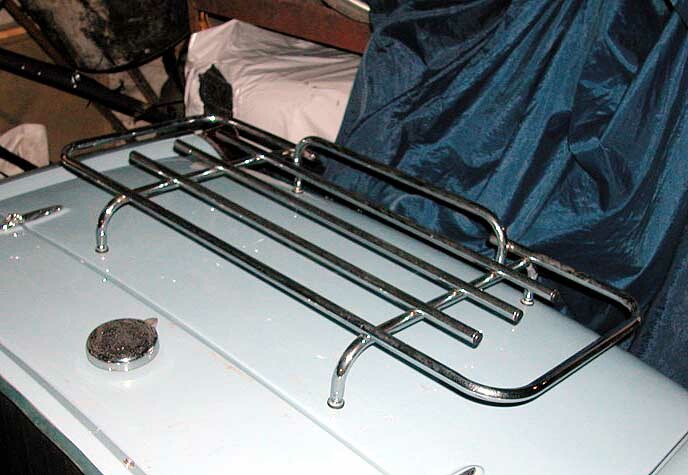 This Paddy Hopkirk (of MG racing fame) rack is for sale (£20 or exchange for parts for a 1966 MkII). Contact John Zissler for more information. 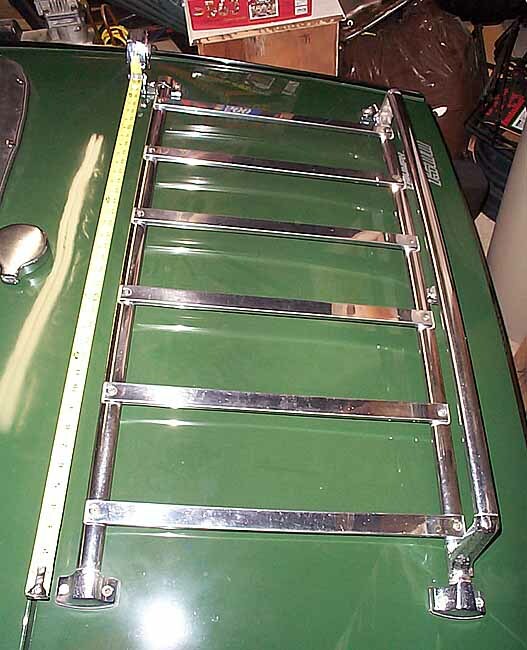 Another Paddy Hopkirk rack with black mounting hardware (unknown British owner). 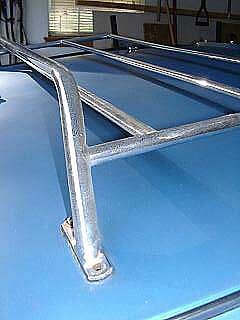 This rack is very similar to the Paddy Hopkirk rack but has slightly different mounting hardware and the vertical bar is welded on not attached on top. 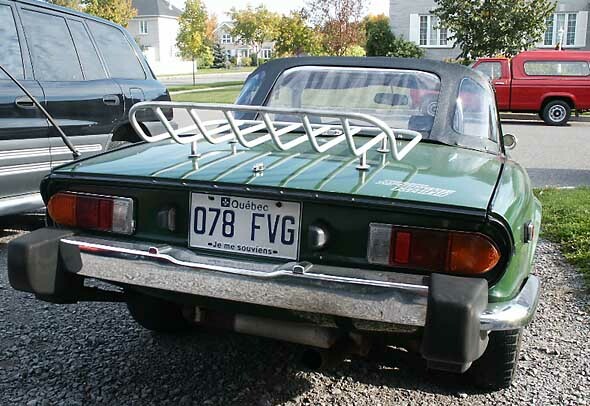 "This is a luggage rack that I picked up for my 76 Spitfire. I replaced the wood with Teak and it turned out real nice. 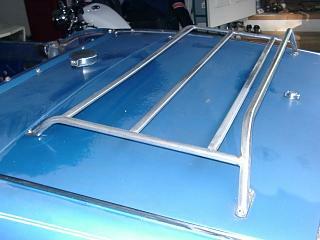 The frame is aluminum that I polished up." 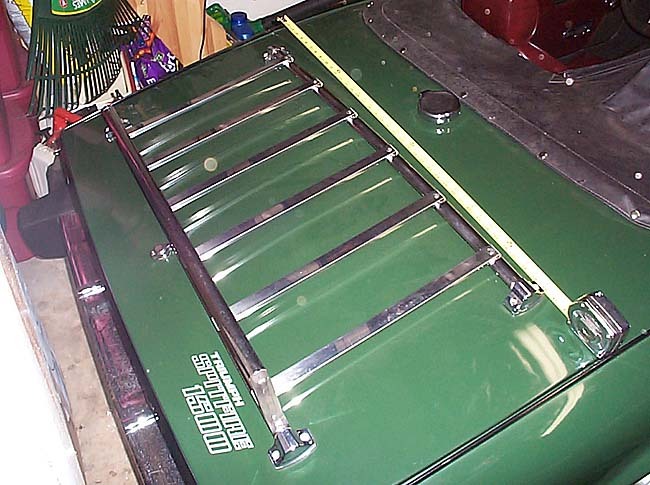 An interesting solution to not being able find a factory rack: a Honda ATV rack. This one came is shown on Christophe Legasse's Spitfire. 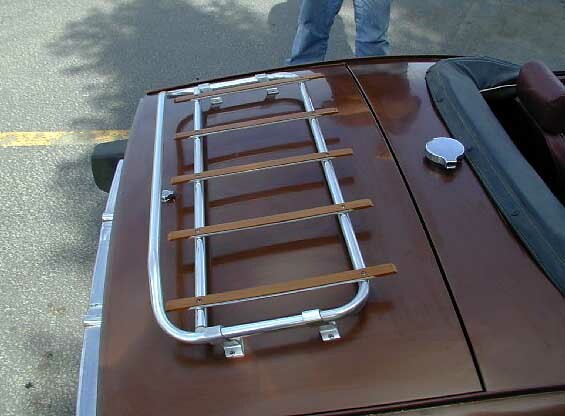 From what I understand may luggage racks were installed by the dealer. 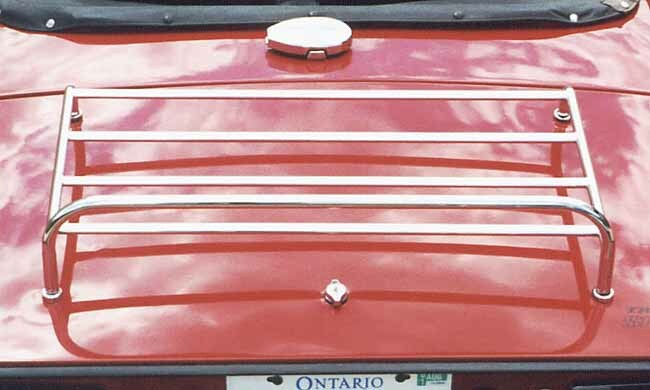 Knowing this they could be just about anywhere on the deck lid. I did some measurements of my "6 Slat" model. Again, the locations are approximate. 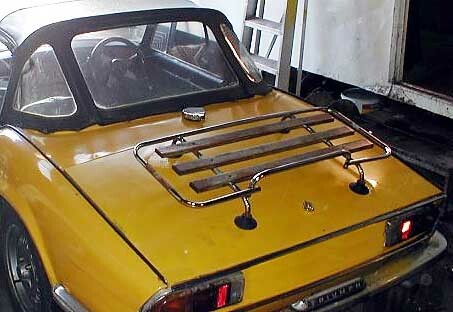 I'm a Belgian Spitfire owner and I followed your luggage rack link and I have the following remark. My rack is mounted the other way round. I know its looks silly but the upright bar serves as a luggage stop in case of an accident and the straps snap. If you look at it that way it seems logical. And as I regularly carry luggage I'm glad to know it's mounted the 'right way'. I have curious about racks for several years. During that time I have been doing a little informal research on them and thought I'd bounce this off of you. 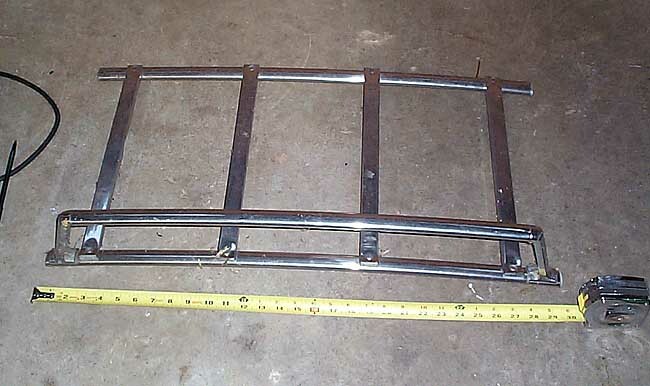 There appears (to me) to be four variations on the "factory" luggage rack, at least on Federal model Spitfires. 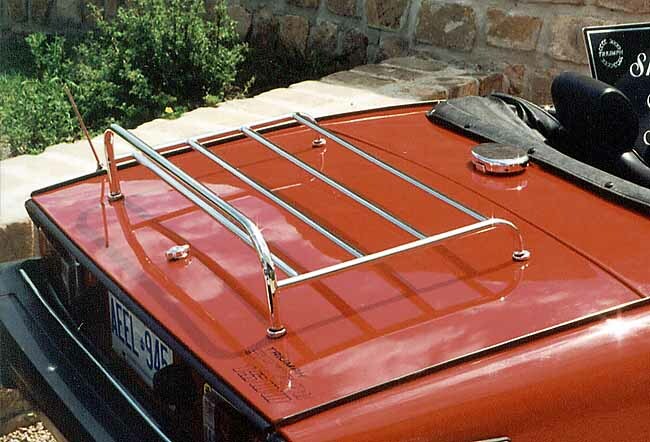 I believe many were indiscriminately fitted to various MG and Triumph cars because the same dealers often sold both marques and the racks were similar. a) "Wide & Flat" - has 6 slats (like yours), but is 40" wide. 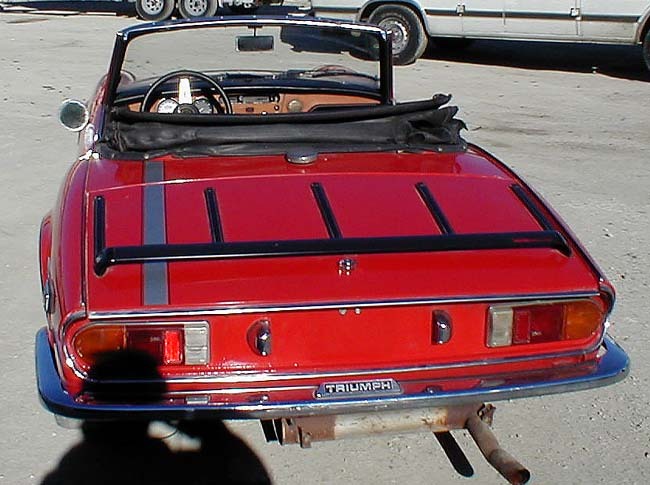 Probably intended for TR6, but I have one on my '78 Spit that I bought new. b) "Medium & Flat" - Your 6 slat. Probably intended only for Spitfires. 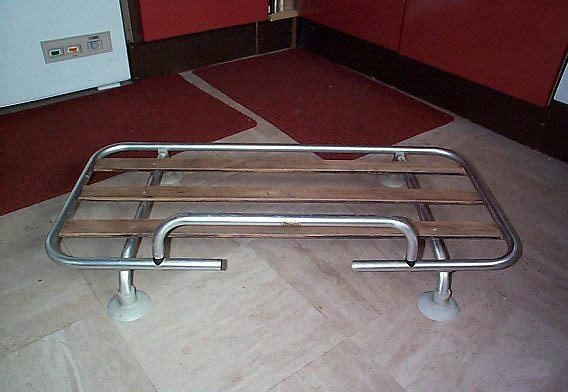 c) "Medium & Arched" - About 30" inches wide, but with five slats and has more of an arch. 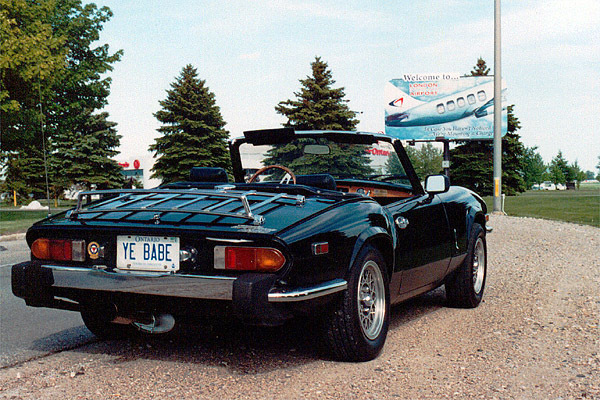 Probably intended for MGB. 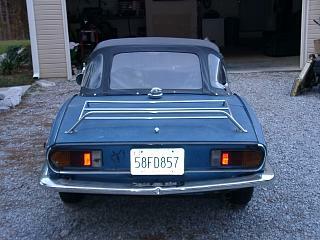 I have one of these on my other Spitfire. d) "Narrow & Arched" - 4 slats, like your picture with pronounced arch to it. I can't tell if the one pictured on your site has as much arch as some I have seen at car shows. 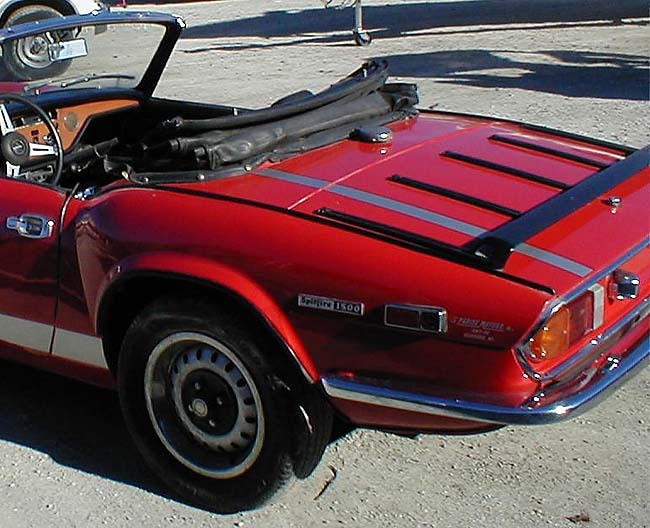 This one was probably intended for MG Midgets.